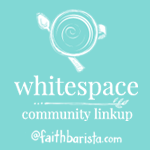 I just received my copy of Bonnie Gray’s (Bonnie blogs over at Faith Barista) “Spiritual Whitespace – Awakening Your Soul to Rest”. I’ve read the introduction, and already I can see that there is very little whitespace in my life. You know, those times when I’m not filling every single moment with doing and not being. For instance, while I’m waiting for an appraisal file to load, I head over to Ravelry or Facebook or Pinterest or my blog or others’ blogs or my email. Multi-tasking. I’m very good at it. If I’m talking on the phone it’s really easy for me to do data entry at the same time while listening to music and watching the birds outside. But why? I hope that reading the book will help me to find those whitespace times so that I can be more appreciative of them. They’re there. I know they are. I just have to learn to not fill them with other stuffs. I love your honesty! Thank you for capturing the effects of multi-tasking; no whitespace! Enjoy the journey of soul rest…God will meet you in the spaces in between!